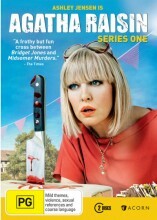 The Agatha Raisin Season 1 DVD from DVDLand. Based on the best-selling series of mystery novels by M. C. Beaton, Agatha Raisin is a former high-flyer from the world of PR, who takes early retirement and rejects London life for the quiet, picturesque Cotswold village of Carsely. However, with a succession of perplexing murders on her doorstep, life turns out to be anything but quiet and Agatha finds herself getting into all sorts of scrapes and awkward situations, both in a bid to solve each crime and to settle into village life. Over the course of the series, Agatha gets embroiled with militant ramblers, competitive gardeners, flirtatious vets and an ex-husband she had presumed to be dead. Each episode works as a standalone mystery, with some threads that weave throughout the series, such as Agatha's on-off relationship with neighbour James Lacey (Jamie Glover), her constant efforts to ingratiate herself with the wary locals and her regular obstruction of, and admonishment by, the local police. Click the button below to add the AGATHA RAISIN - COMPLETE SEASON 1 to your wish list.